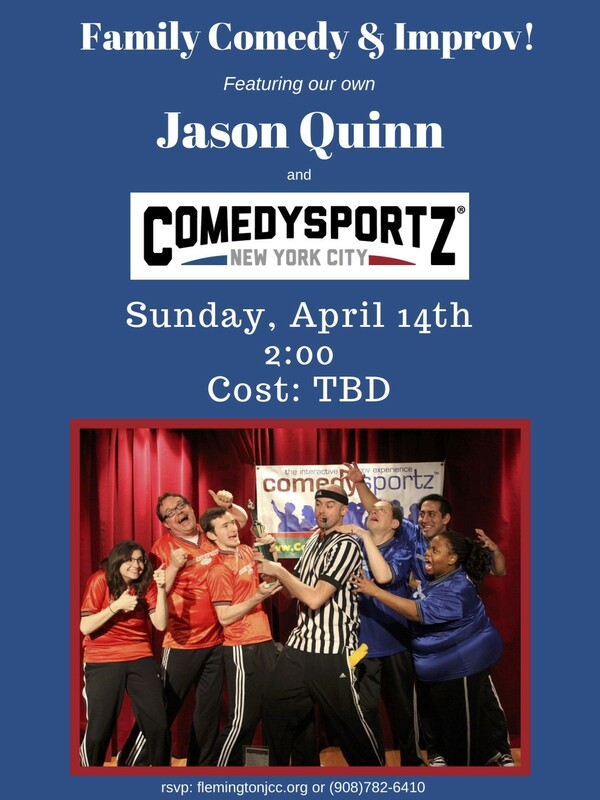 ComedySportz featuring Jason Quinn present Family Comedy & Improv held at the FJCC in Flemington on Sunday, April 14th at 2:00 pm. Jason Quinn has performed improv and musical improv since 2001. As an actor, Jason has had roles in movies and on TV, performed in sketch shows and been in plays and appeared in numerous commercials. Everyone young and old is invited to attend and the cost is $20/adult, $5/child. Please click here to register: https://conta.cc/2RhbPBp. For any questions, please call 908-782-6410, ext. 10. The FJCC is located at 5 Sergeantsville Road, Flemington. Copyright © 2019 Jewish Federation of Somerset, Hunterdon & Warren Counties . All Rights Reserved.